You Asked? was published to celebrate OWL Magazine’s 35th birthday. It contains over 300 questions submitted to Owl Magazine by children over the years and the answers that were provided in past issues. Covering a myriad topics about our natural and cultural worlds, and illustrated by colourful photos and illustrations, this is a volume that will provide great entertainment as well as instructional value to young readers. 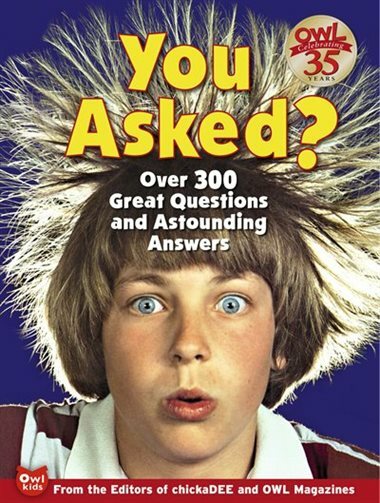 There is an index for those interested in a particular subject, but I suspect children will be happy to open the book randomly and begin reading, or to begin at the beginning and browse through to find questions that capture their attention. This would be a great book to share with a reading buddy too. This review is from Canadian Teacher Magazine’s May/June 2011 issue.